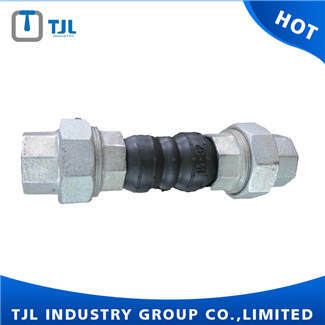 Flexible rubber double ball joint is also called rubber soft connection, rubber elastic rubber joints, pipe shock aabsorber, shock aabsorber, soft joints, shock aabsorber, etc. Is the flexible coupling, metal pipeline by inside rubber and nylon cord fabric, rubber compound rubber ball and loose tube of metal flange a kind of high elasticity, high air tightness, medium resistance and weather ability of pipe joint. Air conditioning, heating and ventilating systems in industrial buildings, hospitals, hotels and on board ships. Central and ancillary power generating stations in industrial buildings, factories, ships and off-shore. Sewage disposal and water treatment plant, pumps, etc. Process piping in pulp and paper manufacture. According to different material, acid resistance rubber joint, flameproof rubber joint, oil resistant rubber joint, thermostatic rubber joint, low temperature resistant rubber joint, wear resistance rubber joint can be made to suitable for various kinds of medium, and environment.